SINGING PILGRIMS is an intergenerational duo performing Celtic, traditional and original music that is so much more than melody and rhythm. Their songs are personal expressions of the path they have walked together for over two decades and their story is woven into the fabric of each tune. The SINGING PILGRIM band members have been making music together for over 20 years–beginning when Natasha was a small child in “The Apple Mountain Harp Kids” ensemble directed by Jeanne. 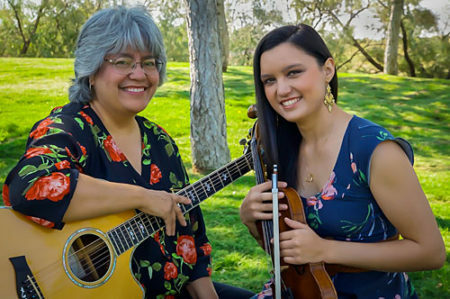 Their musical journey morphed through the years and Jeanne and Natasha became more than teacher and pupil when they became bandmates in “The Next Chapter,” (New Mexico Talent Showcase Champions). Thousands of Albuquerque residents attended their hugely popular “Celtic Christmas Concert” series held annually for a decade. Jeanne Page, (“Mama J” to her band-mate, Natasha) , is a best-selling author of Hammered Dulcimer books with Mel Bay Publications. While the hammered dulcimer was Jeanne’s main instrument in previous bands, in “Singing Pilgrims,” she focuses on her first love, the guitar. Natasha Coffing is a multi-instrumentalist composing on the piano as well as the Celtic harp, but long ago, the fiddle became the instrument that felt most at home in her hands. Tasha’s aggressive and passionate playing stye has become the centerpiece of the “Singing Pilgrims” signature sound. Both ladies also take a turn at the harp, the instrument that first brought them together on their shared journey. Since becoming "Singing Pilgrims" they have toured Ireland twice and played at festivals all over the nation including The North Texas Irish Festival, The Chicago Gaelic Irish Fest, the Longs Peak Scottish Irish Festival (Scotfest) and the Smoky Mountain Highland Festival. Natasha and Jeanne look forward to the next direction their joint path will take them.